Marie Redfearn Smith is the daughter of a recognized South Carolina artist, Evelyn Redmond Redfearn. Having grown up with the beautiful paintings done by her mother, Marie was always facinated by visual arts. While her mother created beautiful still life paintings in impressionistic and realistic styles, Marie was personally attracted to a more expressionistic style of painterly gestures. Struggling to achieve the precision she thought to which she should aspire, she noticed that she enjoyed the first hours of a painting as she was laying down the first layers of work. As long as her gestures flowed from inside, the paintings would completely satisfy her. But, when she attempted to transform them into a more realistic style, the work started and the fun began fading. One day Marie's aunt, Mary Martin, visited her studio and pulled out pieces that she felt would transform the viewer for her gallery, Marie found that the pieces pulled for the gallery were the ones she painted for herself and her enjoyment. Upon the arrival of these paintings to the gallery, the works immediately attracted attention from both staff and patrons. 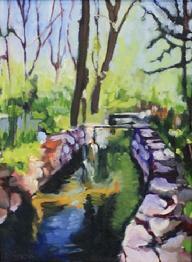 Mary Martin says, "Her paintings are deeply satisfying and beautiful." Mary Martin & Co., Inc.